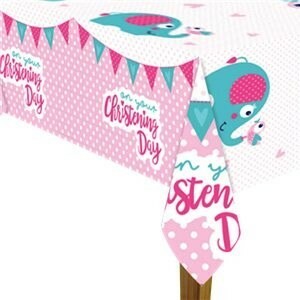 Christening Day Pink Tablecover is designed with the iconic little elephant looking at a little bird on the tip of her trunk. Delightful pink hearts feature upon the white background of the tablecover and the border has the words 'On Your Christening Day' delicately written. Plastic tablecover measures 1.8m x 1.2m.